Distribution area: The Golden Tree Snake is to be found throughout Thailand. 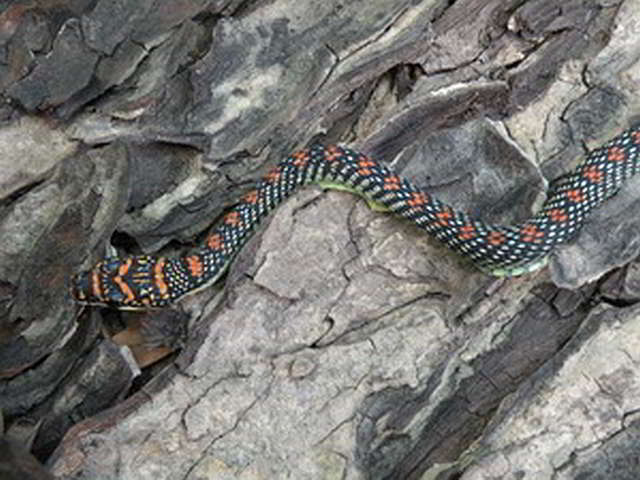 Behaviour/habitat: Chrysopelea ornata ornattissima is a flexible snake. It can be found in forests, on plantations, in gardens and in houses. This snake is regularly found in the inner city areas of Bangkok and Pattaya. As they feed on rodents, geckos and other lizards, they are often found on and in houses. These snakes are active during the day, can climb walls and are very fast. Danger level: If they feel threatened and cannot flee, they bite straight away. 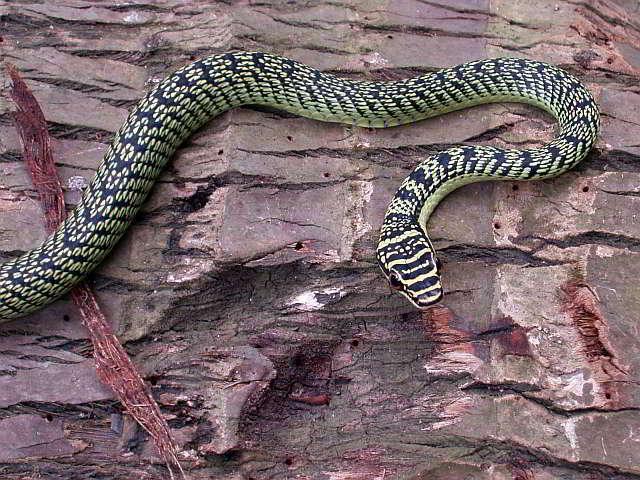 The species Chrysopelea belongs to the family of rearfanged snakes. However, the venom so mild that it does not have much of an effect on humans. Habitat/Habits: The Paradise tree snakes inhabits the forests in the lowlands and the mountains. In Thailand the distribution is restricted to the coastline. The snakes are active during the day. They mainly feed on lizards and frogs. In captivity the snakes sometimes also accept mice. The females lay twice a year a clutch of between 5 and 8 eggs. Like Chrysopelea ornata, also Chrysopelea paradisii is able to glide by spreading their ventral scales. The specimen shown here is from the Ranong aerea. In other aereas there also can be found specimen with a basic green or even white coloration. Danger level: Chrysopelea has grooved fangs in the back of the upper jaws. A bite has for humans normally no consequences, as the snake has to chew the venom into its victim. Only if the snake would chew several minutes on the hand of the person it could have consequences.